The Leica DISTO™ A6 available from Merlin Lazer Ltd lets you operate with a typical measuring accuracy of ± 1.5mm from 0.05 to 200 m. Its integrated Power Range Technology™, which permits measurements of up to 100m without a target plate, and integrated 2x viewfinder provide you with an unbeatable combination of operating features for all measurement tasks completed outdoors - even in sunlight, so you will now be able to see just what you are measuring. The software DISTO™ transfer sends your measurement readings, directly and without wires, to your Pocket PC or laptop for further processing with the program of your choice. The application operates in the background, so you will not even notice it running. If you wish, you can also use the Leica DISTO™ A6 to control the cursor movements of the program, without having to use the stylus of your Pocket PC. You will soon be convinced by the powerful combination of Leica DISTO™ A6, Pocket PC und PC! Like the Leica DISTO™ A5, the Leica DISTO™ A6 is characterised by its end-piece with automatic sensor detection and slip-free softrubber grip handle. Reliable measurement from edges or corners is made simpler than ever. Leica Geosystems is also launching the Leica DISTO™ A2 available from Merlin Lazer at the same time. This ideal entry-level budget device for laser measurement tasks has been specially developed for indoor use. Leica DISTO™ offers the right device for any type of application. Thanks to high quality and reliability, Leica Geosystems is able to offer a two-year warranty on all Leica DISTO™ units. The Leica DISTO™ A6 will be available from mid-late July - To pre-order your DISTO™ A6 and be one of the first globally to own one simply contact us on 01892 654141 and speak with one of our Disto trained sales staff who will also be happy to answer any questions regarding this tool or other models in the 6th Generation Leica DISTO range. 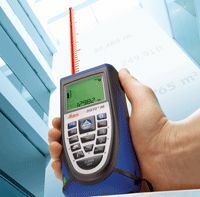 When fast and accurate measurement of long distances is required, the professionals turn to the original DISTO™ hand-held laser distance meter from the Leica Geosystems Measuring Tools Division. The Leica DISTO™ brand covers a wide range of models , which are currently being operated by almost a million professional users worldwide, from craftsmen to architects and people in the real-estate business, along with many others. They all benefit from the speed and accuracy of this handy laser distance meter. Leica DISTO™ lets you obtain measurements at the push of a button, which saves your time and increases your productivity.